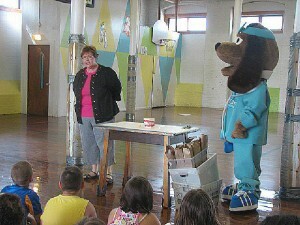 FULTON, NY – UnitedHealthcare treated youth in Catholic Charities of Oswego Countyâ€™s CYO Summer Recreation Program to a special presentation on good dental hygiene courtesy of Susan Heely and Dr. Health E. Hound of AmeriChoice. Youth participating in Catholic Charities of Oswego Countyâ€™s CYO Summer Recreation Program enjoy a special presentation on the importance of good dental health by Susan Heely and Dr. Health E. Hound of UnitedHealthcare. The children were attentive and asked many questions as Heely spoke to them about the importance of dental health and demonstrated how to care for your teeth through proper brushing and flossing. Students were also treated to special appearance by Dr. Health E. Hound and received a complimentary toothbrush and toothpaste. The CYO Summer Recreation program is funded in part by the United Way of Greater Oswego County, the NYS Office of Children and Families, and the City-County Youth Bureau of Oswego County.